Tatiana Volosozhar and Maksim Trankov, as well as the pair’s coach Nina Mozer, who went missing in Friday’s Tokyo earthquake, are reported to be safe. The Federation had lost touch with the skaters, who arrived to Japanese capital just three hours before the first tremors and tsunami hit the city, earlier this morning. Since the earthquake, all types of communications, including the internet and mobile communications, in the city, have been virtually inaccessible. Tatiana Volosozhar and Maksim Trankov came to Japan to hold several training sessions before the World Championships, which will be held from March 21 to 27 in the capital of Japan. 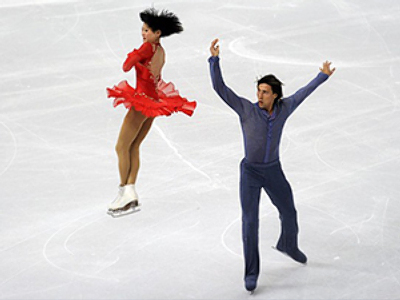 Following the Tokyo earthquake, the Russian Figure Skating Federation lost touch with athletes Tatiana Volosozhar and Maksim Trankov, as well as the pair’s coach Nina Mozer, who came to the Japanese capital for the World Championships. The fate of the Tokyo tournament is now in jeopardy, with the final decision on moving the event to another location to be made during the week. The upcoming tournament was to become the first international competition for the newly-formed pair of Tatiana Volosozhar and Maksim Trankov, who were earlier skating with other partners. Ukrainian born Volosozhar took up Russian citizenship, which put the duo on quarantine, forbidding them from international sports till February 16. But they have not wasted time putting their stamp on the sport since then, claiming the title of the pairs’ champions of Russia.